Bring organization and modern design to your patio, living room, or garden with this 2 tier display stand. 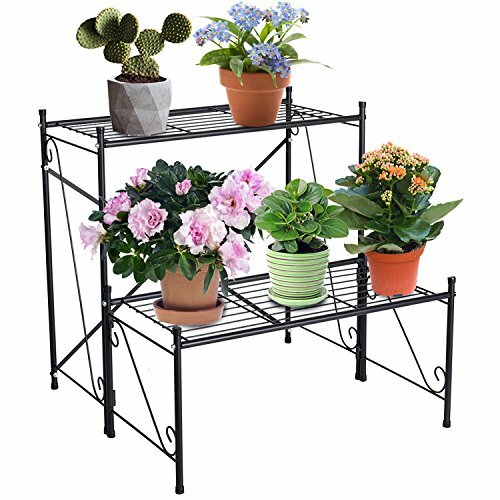 Made of sturdy and durable metal with a matte black powder coated surface, this 2 tier display rack suitable for hall, living room, bed room, garden, pool area, balcony, rooftop, flower shop - Decorative accent to any garden party or outdoor event. A perfect decoration tools to decorate home, garden, yard, patio, bar and more. When you're ready to bring organization and style to your indoor or outdoor space, this metal display shelf rack will help you do just that. Assemble: Simply assemble without any tools. The 2 stair-step style shelf provide plenty of space for showing off your favorite plants and decorations. Place this rack on your patio, in your balcony, or out in your garden to add a touch of charm to your daily routine. Installation Notes:For installation instructions, please refer to the picture on the left.